When Kon Ichikawa‘s name is mentioned, ears don’t perk up in recognition. Even if “film maker” is added as a hint, most will shrug, go on to talk about Kurosawa, Eastwood, others…. Too bad, because in the 1950s, in post war Japan, he made two of the most powerful movies on war that have ever been seen. The Burmese Harp (1956) and Fires On the Plain (1959.) Both are now available in the new Criterion series of classic films [many available on Netflix,] with commentary from directors, historians and critics. You’ll want to see them, and together. When seventeen year old children in your presence get glassy eyed from the pleasure of wars imagined, or seen on the screen, buy them tickets to these, and go with. Once seen, not forgotten. Both films are about the actions of platoon sized elements of the defeated Japanese Army in the last months of World War II. 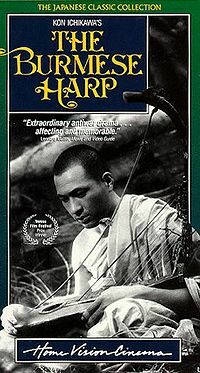 The Burmese Harp takes place in Burma (though most was filmed in forested parts of Japan) as a platoon of soldiers faced with the inexorable advance of Allied (U.E., British, Indian, Chinese) forces –the tide having turned since the Japanese ascendancy in 1942-43 in Burma, and about which the Bridge on the River Kwai is a well known filmic telling — wrestle with fighting to the finish, as had been drilled into them, or surrendering. Surrender was considered an act of cowardice. One soldier swims against the tide of death by suicidal attrition, trying to persuade his comrades to be part of building the new Japan; their deaths now were simply foolish. They condemn him and he slips away, stealing a bathing Buddhist monk’s clothing for disguise and gradually becoming a monk himself, staying behind in Burma to bury the dead, and to carry some of the pain he was witnessed. As in The Burmese Harp, also based on a novel, in 1948, by Michio Takeyama, the soldiers are wrestling with surrender or death. It is not fear of imprisonment, torture or death if they surrender; it is that surrendering is an act of cowardice. Japanese soldiers have sworn before their God-King. They have a wrenching decision to make, if it can be made at all. Surrender, as a physical proposition would be the easiest of all choices. And it isn’t the daily battering of big guns, snipers and superior forces advancing, though there is some of that. It is their utter exhaustion, their starvation, their lack of equipment, clothes, medicine and food. The scenes of men listlessly trampling through the mud, stopping to look at shoes on the road to see if they are better than the ones they have, the theft of shoes from men just barely dead, the look of emaciated exhaustion on their faces is unlike anything I have ever seen. I have read stories of the U.S. Civil War, in which freshly dead bodies were ransacked for better clothing and equipment, and similarly in Napoleon’s retreat from Moscow, or Moscovian’s resistance to the Nazi seige. Nowhere have I seen it depicted in such a way that my feet hurt, I shivered in the drenching rain. In fact I viscerally felt the tug to get some protein in my belly, regardless of the source. Ichikawa gathered a determined group to make the film in 1959. The war has ended only 14 years earlier. War Crimes trials had been held, in Japan. Over 5,000 had been tried, 900 executed. The sense of shame and complicity in Japan for the years of imperialism was wide-spread. Nevertheless, to make a film so explicitly pointing at war-time behavior was fraught with controversy. Ichikawa was determined. His own family had been living in Hiroshima the day the first atomic bomb was dropped. He had not been in the city, and didn’t know for weeks what might have become of his family. They survived in a outlying area of the city. Ichikawa saw the devastation up close. The lead actor Eiji Funakoshi [Tamura] was so determined to act the part of a fleeing, starving soldier he showed up for the first day of shooting, and collapsed at its end. His wife told Ichikawa he had been starving himself for a month to be ready for the part. The filming was postponed for several weeks while he recovered. 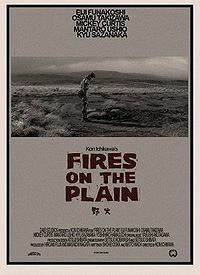 The theme of hunger and starvation, already a minor part of most war films, takes on a central role in Fires on the Plain. Hunger for most movie warriors is having to eat C-rations day after day; it’s shown in the happiness of finding fruit or bread at some unexpected point. Never have I seen, not just a mention of hunger-that-leads-to-cannibalism, but a deep and graphic exploration of it, an exploration that does not smugly set down the behavior to aberrant action of one or two, but to the logical and necessary outcome of a war like this: to fight, we much be strong; to be strong we must have meat. Call it monkey meat, call it what you want. Look away if you can’t stand it, but eat, and fight. The Burmese Harp is a much less trying film. The cracking of bodies, the starvation, the sheer misery is not the arresting part of the canvas. The decision to surrender or not costs the soldiers less. Though following the soldiers as they retreat across Burma, and seeing them wrestle with their decision, its major interest is how a man makes amends; how a deepening sense of compassion is born, how sacrifice is conceived of and carried out in the name of balancing the weight of war and loss. The growing being-against-the-war is seen in the growing, quiet absorption of what has happened in the eyes of the deserting, becoming-a-monk, soldier. There is a deep sadness but a forward going, a suggestion that had the compassion been more widely held in the beginning the carnage would have not happened. There is resolution. I would recommend seeing them in reverse order: Fires on the Plain was made after The Burmese Harp. See it first, with its more haunting, more despairing fullness of war, unbearable for some to watch. Follow with Burmese Harp which was made first. Ichikawa and Wada, converted it to an adult morality tale about the carnage and ache of war, and what one man is moved to do. Kon Ichikawa only died recently, January 2008. It’s too bad he isn’t more widely known, and his detestation of war more widely shared. There is nothing of the patriotic, hero petting, flag waving of so many war films — even those which pretend to show it all. Nor are we buried beneath the technological glory of fast loud airplanes, beautiful scarlet explosions, sweaty but determined and ultimately winning men. We are seeing war as so many have seen it, and come home never to talk about again. These are war films like none you have ever seen, and perhaps the only war-time musical worth citing as one. The choral whistling and catchy tune of Bridge On The River Kwai, the sister film of war in Burma, pales before the rich, resonant singing in the Burmese Harp. You’ll want your own copy.